The Falcons may be 6–1, but for fantasy owners, everything is not fine in Atlanta, as QB Matt Ryan's unimpressive numbers are troubling. Matt Ryan was the seventh quarterback off the board in a typical fantasy draft this year, comfortably in front of Tom Brady and just behind Ben Roethlisberger. Anyone who took him that high is likely disappointed with his performance through the first half of the season. In this week’s Fact or Fiction, we look at one of the primary reasons for Ryan’s struggles, as well as what he needs to make his season turn a corner. Without looking, guess where Ryan ranks among quarterbacks in points per game in standard-scoring leagues. We’ll take Tony Romo and Ben Roethilsberger out of the equation because of their injuries, and limit it to quarterbacks who have played at least five games this season. You may realize that Ryan isn’t exactly having the best season of his career, but you might be surprised to learn what that has translated to for fantasy purposes. Is your guess outside of the top 20? It should be if you want to be right. And for the record, I would have been wrong, as well. Through seven games, Ryan ranks 22nd among quarterbacks with 16.4 points per game. He trails Jameis Winston (16.8), Joe Flacco (16.9), Matthew Stafford (17.1) and Josh McCown (18.2). In fact, among quarterbacks who have started every game this season, Ryan is ahead of only Kirk Cousins (15.9), Alex Smith (15.8), Colin Kaepernick (15.1) Sam Bradford (14.3), Teddy Bridgewater (13.5), Peyton Manning (13.1) and Nick Foles (12.0) in average scoring. This is despite the fact that he plays with the No. 1 running back and No. 3 wide receiver by points per game. It’s nearly impossible to have teammates that good at running back and wide receiver and post as poor of fantasy numbers as Ryan is on pace to accumulate. Just how hard is it, you ask? Let’s delve into this a bit deeper. Beginning with the 2000 season, nine sets of running back and receiver teammates have finished in the top five at their respective positions in the same year. Seven of those teams also had quarterbacks who started at least 15 games, the two exceptions being the 2000 Broncos (Brian Griese missed six games due to injury) and '13 Bears (Jay Cutler was on the shelf for five games). The seven remaining teams were the 2000 Colts (Edgerrin James and Marvin Harrison), '07 Colts (Joseph Addai and Reggie Wayne), '08 Panthers (DeAngelo Williams and Steve Smith), '10 Chiefs (Jamaal Charles and Dwayne Bowe), '13 Broncos (Knowshon Moreno and Demaryius Thomas), '14 Steelers (Le’Veon Bell and Antonio Brown) and '14 Cowboys (DeMarco Murray and Dez Bryant). Five of the seven quarterbacks who played for those teams finished as QB1s in standard 12-team formats, with 2014 Tony Romo the only one who was outside the top six. The two who weren’t? Jake Delhomme was the quarterback of the 2008 Panthers. While Stewart and Smith were fantasy monsters that year, Delhomme had just 15 touchdowns in 16 games, and finished as the No. 20 quarterback. Two years later, Matt Cassel was the starter for the Chiefs. Charles racked up nearly 2,000 yards from scrimmage, while Bowe scored 15 touchdowns that year. Cassel was mostly good that season, throwing for 3,116 yards and 27 touchdowns against just seven picks, but that made him just the 14th-ranked quarterback, 0.2 points behind David Garrard and 5.2 points short of Joe Flacco for the final spot in the QB1 class. Ryan is on pace to have the worst season, relative to the standards of that year, for any quarterback who played with a top-five fantasy running back and receiver. Ryan entered this season coming off a three-year average of a 67.4% completion rate, 4,642.67 yards, 28.67 touchdowns and 7.35 yards per attempt. He hasn’t been totally dependent on the deep ball, but it has always been an important part of his game. Ryan was in the top 12 in deep pass attempts, completions, yards and accuracy percentage (completions plus drops divided by attempts) in 2012 and '14. This year, no quarterback who has started all of his team’s games has fewer deep pass attempts than Ryan’s 19. Thanks to Jones, he’s still 11th in completions (nine) and 20th in yards (263), but Ryan’s not going to finish the year as a QB1 without growth in the deep passing game. Part of this deficiency is due to play calling. Ryan has unloaded 62.5% of his pass attempts in 2.5 seconds or less, according to Pro Football Focus. That’s the 10th-highest rate in the league, tied with Alex Smith, king of the quick hitter. This belies the fact that Ryan has been under pressure on just 27.8% of his dropbacks, which ranks 28th among all quarterbacks. Part of it, however, is because of execution, something that was on display in the Falcons’ uninspiring 10–7 win over the Titans last week. Ryan was 1-for-4 on passes that traveled at least 20 yards in the air, leaving a few big plays on the field. Ryan might not be losing sleep since his team came away with the victory, but he would have been sick about this one had the Titans pulled off the upset. Below is a first-and-10 at the Atlanta 37-yard line. Ryan is in shotgun, and when the team first comes to the line, Freeman is with him in the backfield. 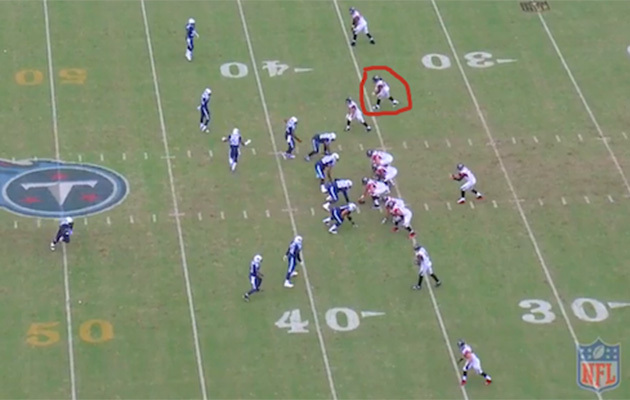 He then shifts and lines up as a receiver just inside the numbers to the right of the formation. It’s now an empty set with five wide receivers. The Falcons have succeeded in confusing the Titans, producing just the result they wanted. The single high safety is shaded toward Jones, who is on the opposite side of the formation. That means Freeman has a linebacker, Wesley Woodyard, in man coverage. 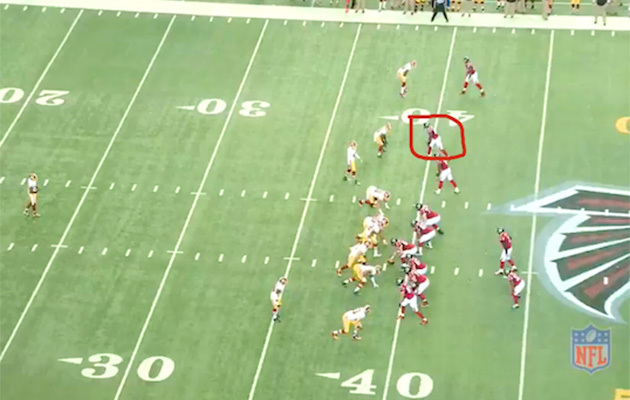 Here’s the look when Ryan takes the snap, with Freeman circled. Freeman easily beats Woodyard right off the line. If Ryan hits him, it’s a walk-in touchdown. Instead, he overshoots him, and also misses his target toward the sideline. Even if Freeman had been able to flag this pass down, the fact that it missed so far east-west would have given Woodyard a chance to catch him and make a touchdown-saving tackle. Let’s go back a couple of weeks to Atlanta’s hard-fought win over Washington. The Falcons were heavy favorites at home, yet needed a pick-six in overtime to come away with a 25–19 win. Ryan struggled mightily in that game, going 24-for-42 for 254 yards, zero touchdowns and two interceptions. He was 0-for-4 on deep passes in that game. One of those misses certainly would have been a touchdown, while another could have been, given Jones’s prowess after the catch. We’ll take a look at both. The first one we’ll examine actually came second chronologically, but does a good job illustrating how off Ryan is on the deep ball. It’s third-and-5 from the Washington 39-yard line, and the Falcons trail 7–3 in the third quarter. Ryan is in shotgun with three receivers, including the eventual target on this play, Leonard Hankerson, to the right of the formation. 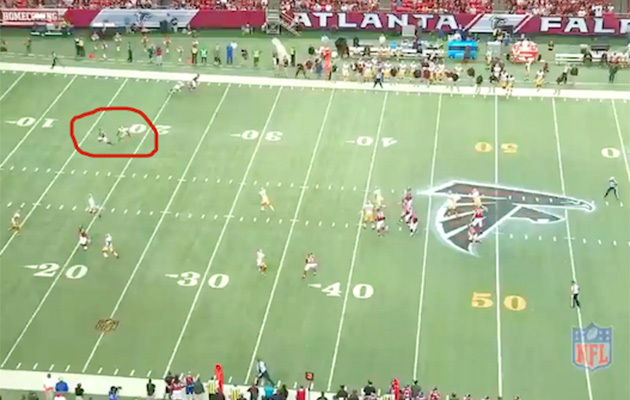 Hankerson is the receiver just inside the numbers, circled in the screenshot below. Yet again, Ryan gets man coverage for all his receivers except for Jones, who, as usual, has to deal with safety help over the top. Hankerson beats his man to the inside, gets half a step in front of him, then breaks off a post, creating two yards of separation, as you can see in the following screenshot. You can also see the immaculate pocket from which Ryan has to pass. This throw is a layup for a good NFL quarterback, but Ryan completely missed his target, throwing the ball far too in front of the receiver. That is, quite simply, an inexcusable miss, and Ryan would likely be the first person to say so. I would be remiss if I didn’t include a play that had Jones as the target. 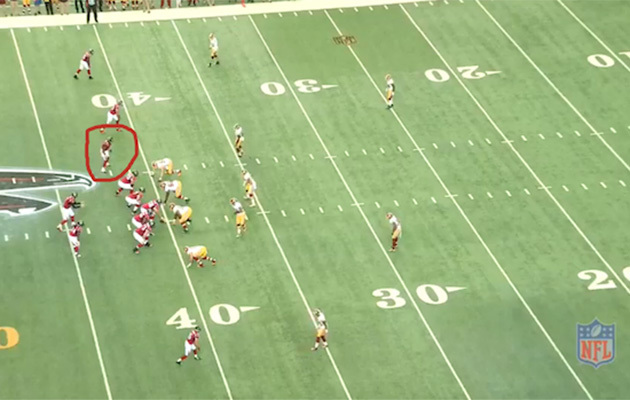 Atlanta’s first possession in the Washington game ended with a Ryan interception on a ball he threw high to Jones. Had it been on the mark, it could have gone to the house, altering the complexion of the game right from the start. As usual, let’s start with a screenshot of the formation. Jones is circled, just to the left of the left tackle. If Ryan hits Jones, this is, at the very least, a big play setting the Falcons up in the red zone. More likely, Jones would have taken it to pay dirt. 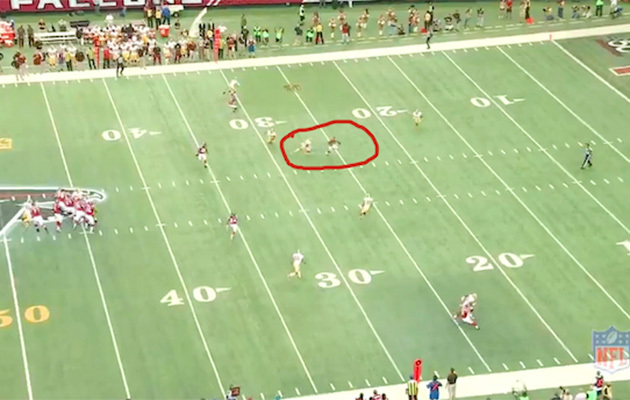 Instead, Ryan threw it above and behind Jones, directly to Redskins SS Trenton Robinson. Ryan is well outside the QB1 class through the first seven weeks of the season because he is missing the deep throws he hit with regularity over the last three years. Unless he turns that around, it’s going to be a frustrating second half for his owners.